"Thomson and Hanson were two very different contemporaries. Hanson the irascible romantic and Thomson the sardonic commentator. Hanson the luminary of the Eastman School with a heritage in hundreds of students and Thomson the clever and sophisticated writer, practitioner and opera composer. There you have it: lovingly done classic Thomson and an expansive, handsomely recorded Romantic." 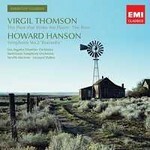 Virgil Thomson and Howard Hanson were exact contemporaries, both being born in 1896, and both hailing from the mid-west: Thomson from Kansas and Hanson from Nebraska. While Thomson studied in Paris with Nadia Boulanger and lived there for 15 years, Hanson received his musical education entirely in America, except for a three-year stay at the American Academy in Rome. Although Thomson composed a good deal of music in various genres, including two operas with texts by his friend Gertrude Stein, he was equally well-known in his time as an influential music critic, journalist and composer for the stage and the movies. Indeed, two of his best-known works are the scores for the famous documentary films The Plow that broke the Plains (1936) and The River (1938), both contained on this CD. Although Hanson composed a fine catalogue of works, including seven symphonies and a well-known opera, Merry Mount, is was as an academic and conductor that he made his name. Shortly after returning from Rome, Hanson's conducting was noticed by George Eastman, founder of the Kodak Company and inventor of the roll film who, in 1921, had established the Eastman School of Music in Rochester, New York. Hanson remained as director there from 1924 to 1964, during which time he built up a large catalogue of recordings for the Mercury Company conducting works by mainly American composers, including many his own music.